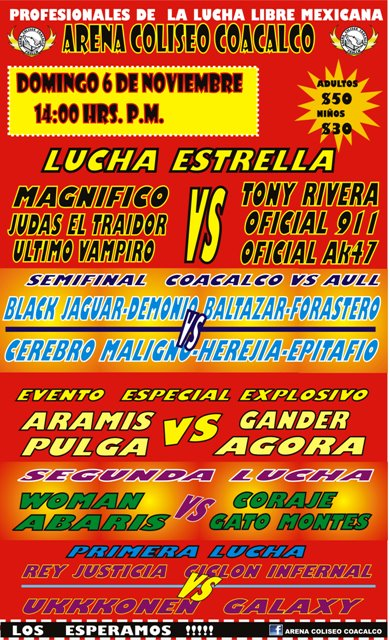 Daga, last seen here as part of team IWRG, replaced Atomic Boy, Tiger Cota replaced Mortiz. Argenis pinned Cota for the win. Casandro was announced for this match, then pulled from the match, then wrestled in the match as a surprise. 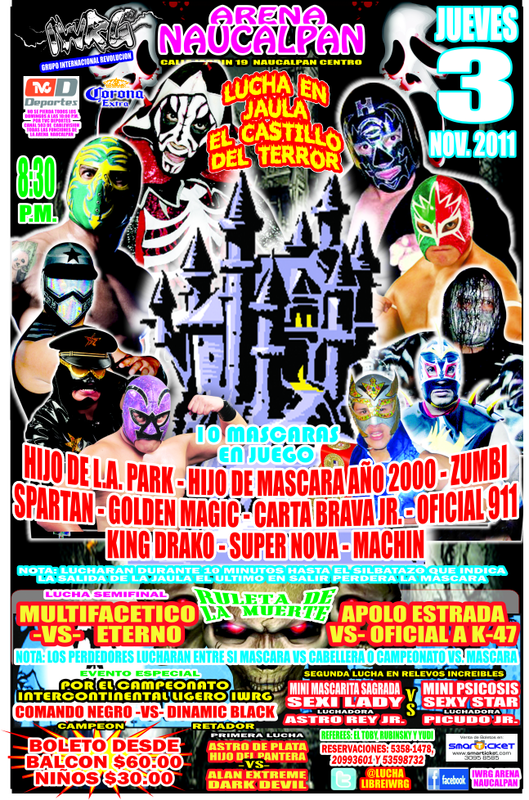 El Brazo wrestled as La Braza. Casandro pinned Nygma for the win. Sugi reappeared to replace Drago. Parka dominated the tecnicos, but Aerostar got Super Fly with a 'rana for the win. La Sociedad hit the ring after the match. Konnan talked about Antonio Pena calling Octagon and Konnan first when he decided to call AAA (which is the real story.) Konnan said Pena had promised to one day give Octagon and Konnan shares in the company, but the Roldans never lived up to the promise. Konnan stripped Super Fly of his Milicia leadership for this latest failure, and appointed Octagon as the new leader. Octagon reminded the crowd of his promise to strike back at everyone who's done his wrong, and ordered the Milicia to destroy Super Fly. They did, utterly massacring Super Fly. Recap notes this is the same building where Super Fly took out Octagon earlier this year. 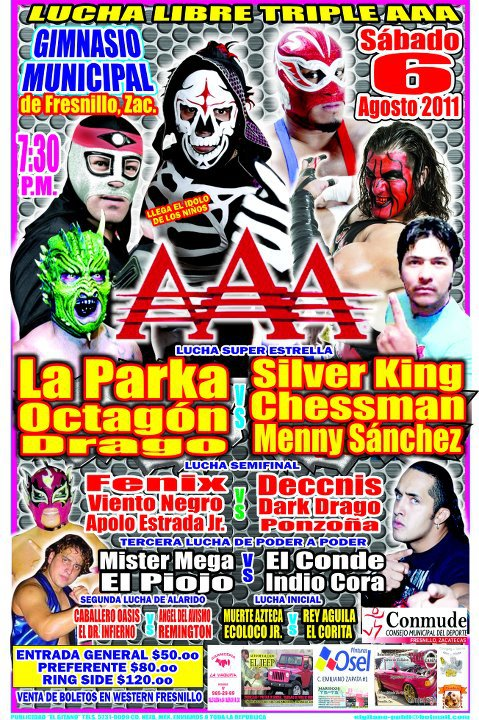 LA Park interfered, setting up Chessman sneaking in a foul on Wagner, and Octagon grabbed the pin. The Milicia was out with Octagon and also getting involved in the match. Park beat Zorro with a powerbomb. Wagner ran out for Park after the match, Octagon ran out after him, and Zorro made the save. Zorro reaffirmed he's part of AAA. 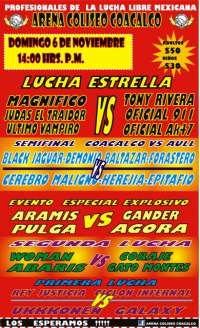 Event Notes: After the opener, Joaquin Roldan (w/Mesias, Electroshock, Zorro, Aerostar, Fenix) responded to Octagon and Parka's reasons for teaming. One of Parka's reasons had been AAA sending Ozz & Cuervo to Japan to stop them from helping him against the Bizarros, but Roldan pointed out those two had won the AJPW tag team titles. Roldan pointed out Parka could've teamed up with any of the other guys in the ring, but Parka refused. 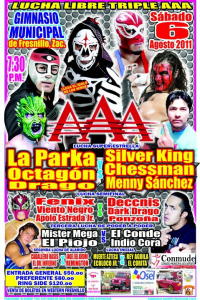 Joaquin says AAA will continue to be #1 with or without Parka. Konnan and Dorian came to the ring to mock the Mexican fans for doing the "You can't see me" and counting in english.